If your company is intent on building a brand, then we can tailor a range of high quality products specifically for you, using your own designed labels. As a fast-paced business you want the best possible service, and our production planning makes this possible. We have the capacity to manufacture product at short notice, and ensure orders are shipped to you quickly and efficiently. Please contact us to discuss your requirements. You might be surprised how we can help you and your business. Working with you in developing new flavours, we thus help you to differentiate your company brand within very competitive markets. If your company wants a range of high quality products with your own label, then let’s discuss this. We can produce a range of own label products tailored to your specific needs. 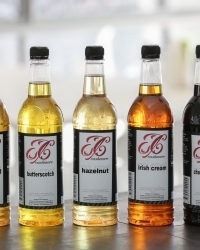 With a choice of bottle sizes and flavours that will work for you, we are here to help you each step of the way.